Our culinary adventure began almost 10 years ago when we first saw a mobile pizza oven for backyards. We had seen them a few times in restaurants and bakeries but never thought about using one in a backyard. They weren’t even that common in restaurants. Thinking it was a great idea we started to sell them, not ever having tried one. I clearly remember the first time we cooked a pizza in one. Didn’t really know what we were doing but when it was time to take that pie out of the oven, which wasn’t very long, I felt like a pizzaiolo. We were hooked. Starting with a few ovens from a small manufacturer in the USA, we found a new passion. The more we got into it, the more we were continually impressed by not only what you could cook in it, but the number of customers that were telling us the same thing. Great food, the best pizza, bringing family and friends together. Some customers were cooking several times a week. Others just never used their BBQ again. The warmth of the fire, the faint smell of smoke in the air, the comfort of being around a fire. And great food. We expanded to import ovens from Italy and added accessories. More and more people started their own culinary adventures. Howvever a good oven was expensive and reasonably priced ovens were of a poor design. We had customers telling us they had been saving for a year or more to buy one. At the same time, we didn’t want sell product that would have to be replaced in a few years. That’s when the story of Forno Venetzia began. First we found a great design team and went to work on a good looking oven, with great functionality and strong specifications. As part of our commitment to time honored, authentic performance was to use a traditional flue design. How well an oven retains the heat is one of the key benchmarks for performance. Heat loss reduces the cooking temperature and increases the fuel consumption. There tend to be two primary exhaust designs found in most wood burning ovens. A simple and less expensive design has a hole cut in the top of the dome for the chimney pipe to be attached. These styles are recognizable by the handle in the middle of the chimney pipe that slides a sheet of metal across the chimney to act as a flue. As heat rises, it tends to escape up through the chimney. This results in lower temperatures and increased fuel consumption. 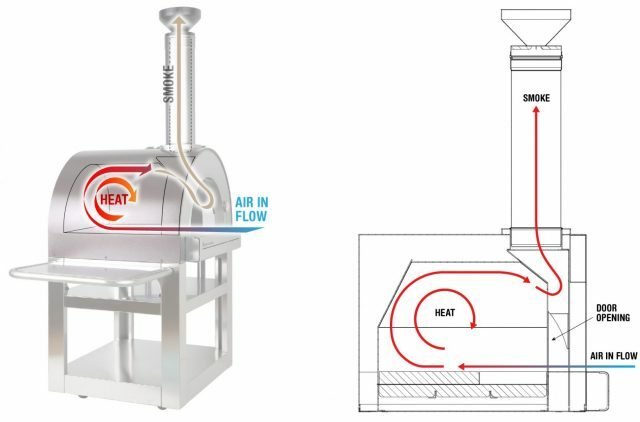 A traditional design, frequently found in commercial and better-quality ovens has the flue opening lower than the top of the dome and just outside the door opening. This creates a draft that pulls the smoke out through the door and up the flue and chimney. The majority of the heat is left to circulate within the dome. This design, while more expensive, results in better heat retention and lower fuel consumption. It is superior for higher temperatures, and baking and roasting when the door is only slightly open. With a great design and specifications in hand, we needed to get it made at a price people could afford and a team of Quality Assurance engineers to make sure it was built right and built to last. Drawing upon individuals from the USA and Great Britain with extensive experience in manufacturing, we found the right team to head up our production. With these pieces in place we built our first oven and never looked back. Once you’ve cooked in one of our wood fired ovens, you’ll ignite your Culinary adventure too. Rich in history, infused with flavor.